Opposition parties were colluding with “tentacles” from outside South Africa to unseat the ANC, alleged the ruling party’s chairwoman Baleka Mbete at a meeting for young professionals in Cape Town this week. The country’s former deputy president and economic development minister Ebrahim Patel were guests of a meeting organised by the Progressive Professionals Forum on Thursday (April 17 2014). This forum “calls together professionals who are ready and willing to contribute towards the growth of our society and country”. US-based investment bank Goldman Sachs also presented a positive review of South Africa’s performance during its first 20 years of democracy. The review was launched late last year. Mbete and Patel said the review and other positive indicators proved that opposition parties and the media were intent on portraying only the negative aspects of the ANC-led government, and ignored its achievements. “Regardless of our good story… there is a narrative from outside the borders, or sponsored from there, that some people have a responsibility to do everything they can to unseat former liberation (movement) governments,” claimed Mbete. Mbete added: “When the ANC put forward a candidate to lead the AU (African Union), we came across such a fight. We know some of the networks we are dealing with have their tentacles in our country. Mbete said she had “been in contact” with politicians from other countries on this matter. She said one politician “from a small opposition party in her country” told her: “I hope you people are ware of this campaign”. “We opposition parties in our countries have been approached over the years that we could actually be funded to come together against the parties that have been in the forefront of liberation struggles,” said Mbete. Patel said the national government has achieved more than the apartheid regime for most South Africans during the last 20 years of democracy. “The net new job creation in the economy was 652,000 people. There was not a single headline about that. Had we lost 50,000 jobs then that would have been a headline. We need to change the public discourse,” said Patel. He wondered why “good news is not highlighted” because it seemed that “good news is an allergy”. “When I quote data that shows a problem in government it is accepted and published in headlines. When I come up with data that is positive, there is a suspicion,” said Patel. She referred to Luthuli House as “what they call the big house”. And said the ANC planned to restructure government departments after the May 7 election. “We will relook at the way that we have structured government. We will look at where we are strong and weak. Where can we afford to dismantle or to reconfigure a department,” she said. Mbete said this department would likely also address South Africa’s private sector expansion in Africa as it was “gobbling up” small businesses in other countries. “Friends of mine have arrived here from Tanzania and asked, ‘Has the ANC thought about that?’ All we saw was a good development. That now we can be players on the African continent,” said Mbete. “The first meeting I had with the president in Ghana, he was fuming about the attitudes of South African business heads. He was saying, ‘They must never do this here’. I had never seen such an angry head of state. Patel also turned to the Western Cape and said it had created more jobs for whites. He said 22,000 jobs were created for Africans last year, while 97,000 went to whites in the province. “White Western Cape citizens have the right to be absorbed into the economy. But when you build an equitable society you want to make sure it’s done in an equitable manner,” said Patel. Colin Coleman, who runs the South African office of Goldman Sachs from Johannesburg, said South Africa remained among the world’s most unequal societies. “This is a long journey… If you take a society that has had 300 years of colonisation, we must adjust our time forecasts. We have deep structural issues,” said Coleman. 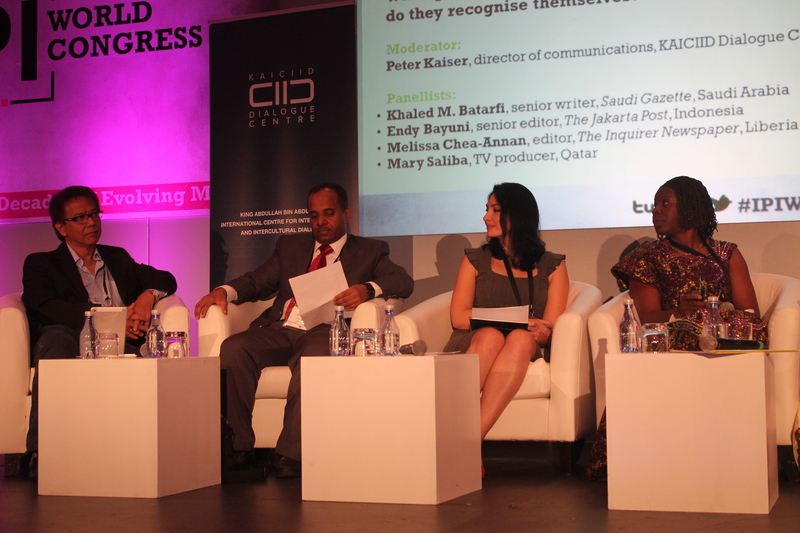 Journalists need to improve their reporting of religion, instead of trivialising it, agreed a media panel at this week’s International Press Institute (IPI) meeting in Cape Town, South Africa. Endy Bayuni, a senior editor at the Jakarta Post newspaper in Jakarta, Indonesia, said simply: “We are not doing a very good job in reporting religion”. Bayuni was part of a the IPI’s annual World Congress panel entitled “Images of Faith: Clash of Perceptions?” He is a board member of the International Association for Religion Journalists (IARJ) which intends to strengthen and improve journalist’s abilities to report on religion. It presently has 515 journalist members worldwide. “The real reason why we are not doing a good job on reporting religion is that it is too complex and journalists are too lazy to study about different religions in our society,” said Bayuni. The King Abdullah Bin Abdulaziz International Centre for Interreligious and Intercultural Dialogue (KACIID), also based in Vienna, Austria, co-hosted the panel on religion. The panel synopsis read: “Often, religion is only present in the media as a cause of division and conflict. Statistics show the majority of religious adherents value respect, peace and cooperation. When people of faith see their images in the media, do they recognise themselves? Peter Kaiser, communications director at KAICIID, started off the discussion with the observation that the “media frames people’s perceptions of religion”. He said the aim of this discussion would not be to “look for positive coverage of religion” but discuss how reporting affects the public’s understanding of religion. Melissa Chea-Annan, editor of The Inquirer newspaper in Liberia, said conflict in her country of 4,1 million inhabitants was prolonged by religion and journalists. “Religion played a major role in prolonging the civil crisis. It caused massive destruction. Christians and Muslims were at loggerheads. They were killing each other,” said Chea-Annan. Chea-Annan said post-conflict Liberia was “now a secular state because we do not want to have conflict between religions”. “All schools used to teach the Bible and all religions wanted to have their religion taught as well. The president then decided to ban the teaching of the Bible in all public schools,” she said. Chea-Annan raised a warning that “religion is creeping into the media” though, creating a sense that journalists were taking sides in an old conflicts. “But as journalists we don’t have to take sides. We have to be balanced in our reporting. We are doing everything we can to unite the media in Liberia,” said Chea-Annan. Australian-Lebanese native Mary Saliba, a TV producer with Al Jazeera English in Doha, Qatar, reflected: “Religion has always been an issue in mainstream media”. “There are a lot of negative images related to religion presented in the media, particularly in the Middle East. We are mixing religious ideology with politics. Also social media heightens a lot of misconceptions and stereotypes. It creates fear,” said Saliba. She said journalists should think carefully before broadcasting or publishing voices that promote hatred of others. She reflected on her work in the Middle East, where volatility pervades politics and by default the social fabric. “We need to ask whether that’s really a news story,” said Saliba. Khaled Batarfi, a senior writer with the Saudi Gazette in Jeddah, Saudi Arabia, said journalists should ask themselves what the reason would be for giving space to an “extremist voice”. “It’s like starting something that is unethical. We are journalists and we are committed to free speech. But we are also citizens and should be responsible. We should not try to fool ourselves and say we are doing our duty. We could end up reporting stories that incite trouble between groups,” said Batarfi. Bayuni added: “We have to make religion an important part of the newsroom, especially in countries where religion is part of people’s lives and where we have different religions. He said journalists also needed to overcome “difficulties in detaching ourselves from our faith” when reporting on religion. “We can avoid that through training because we want to make sure that we get it right. The biggest problem is the attitudes in newsrooms. Most newsrooms just don’t care. They say religion is too complicated. Religion is on the bottom of their list,” said Bayuni. Participants at the panel called for a manual to be written with key words and terminologies that could guide journalists to better reporting and eliminating stereotypes in the media. The IPI, based in Vienna, Austria, concluded on Tuesday (April 15, 2014) its 63rd annual four-day World Congress to discuss issues affecting journalists. It gathered participants – including editors, journalists and others with interests in the media industry – from the IPI’s 120 member countries. This year’s panels discussed various topics, including China’s role in the developing world, democratic South Africa, anti-terror and national security laws in relation to press freedom as well as religion and journalism. IPI advocates for press freedom, the protection of journalists. Twenty years into democracy, the corporate citizen and its social investment arm face a different demand, according to experts working in the sector. This demand comes not only from policy-makers, but also from a savvier society able to sniff out the difference between initiatives that intend to make a sustainable difference in communities from those that serve merely as window-dressing for big business. “There has been a positive shift in CSI spend. There are a lot of organisations trying to help small businesses and put something back into society. Without them we would be in big trouble,” he said. Herrington said businesses shifting their CSI spend over time has meant they are now “becoming more selective. When CSI started, businesses just handed money over. But more recently they have been saying, ‘We are going to spend this money and for that we want to see results’. Desiree Storey, manager of the FirstRand Group’s staff volunteer programme since 2003, agreed that CSI has shifted from handouts to measurable results-based projects. “When I started our programme 10 years ago, it was all about handouts, second-hand clothing, etc. Now we are talking about skills-based volunteering,” she said. “Business wants to know if they can measure how many children received food, for example, and how that impacts on their learning at school. Lynn Husselmann, spokesperson for Liberty’s corporate affairs unit, said: “CSI is most certainly better today than it was 20 years or even a decade ago. Both global and local economic pressures have required businesses to think beyond profits and market share. To remain relevant to its stakeholders, businesses have had to extend their focus to include issues that are most pertinent to the communities and markets they serve. Legal imperatives were also a driving factor for CSI spend, it said. “More companies cited the department of trade and industry’s broad-based black economic empowerment (B-BBEE) codes of good practice as a key driver (44%) rather than industry-sector charter obligations (28%). “However, those who cited licence-to-operate obligations as the most important business rationale for social investment (6% of respondents) gave an average of R105-million in 2013 – at least three times more than those motivated by any other driver. Trialogue’s audit also pinpointed where CSI funds are being invested. It found that companies spent a total value of R7,8-billion on CSI projects in 2013 – a 13% increase from the previous year. The mining, financial services and retail sectors together accounted for nearly two-thirds (65%) of total CSI expenditure. “Mining companies continue to spend substantial sums on infrastructural projects in areas around their operations,” said Trialogue. Trialogue found that the total CSI spend does not equate to cash handouts, though, but other factors too. This included “donations of goods or services” and “donations of employee time during work hours”. “If one is not doing something that resonates with a customer, you become lost in the clutter. CSI provides a touchpoint to our consumers, demonstrating the alignment of values and interests. It has become an expression of an organisation’s brand,” she said. Modern-day CSI required investment into projects with longer shelf life, such as education initiatives, Husselmann said. “CSI has shifted from pure philanthropic gestures to the embracing of social issues aligned to a business’s core focuses and is now a key component of an organisation’s reputation. This matches Trialogue’s research on trends in CSI spend. It found that between 2008 and 2013 there was an increase in the country’s overall CSI spend on education, from 31% to 43%. Social and community development spend remained relatively steady over the same period. During these years, health spend peaked in 2009 at 19%. In 2013, health spend totalled 11% of the overall investment. Low on CSI priorities are arts and culture, housing and living conditions, as well as safety and security.